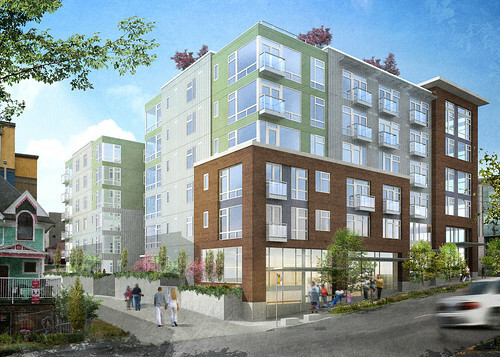 Summer 2011 is shaping up to be a busy time for construction on Capitol Hill — especially at its southern edge along Madison — and now down Broadway. Than the gigantic hole in the ground currently occupying the lot. someone gets mugged at this intersection – its a part of the CD. a nice building goes up and its capitol hill. Fair swipe but also not fair. Don’t know if you’re aware but I also run http://centraldistrictnews.com/ — Tom and I have had to be more surgical from a resource standpoint about how we cover the neighborhoods and that has meant shifting some coverage areas to be more compact and cleaner. If there’s an area that really seems culturally mis-aligned, I’m open to feedback but we had to make a few tough calls and Broadway past Madison was one of them. Hi Justin: I’m sure it is difficult at times to decide if a certain area is part of Capitol Hill, but in this case it is clear-cut as this location if definitely part of “First Hill.”….as is the area south of E Pike St and west of Madison, for example. So, do you plan on covering all of First Hill, or just selected parts?